You’re here to make memories. You want to know the fun things to do. Someone says you have to go the Wharf. You think, “The WHARF? Aren’t wharfs sort of stinky places where fisherman offload their catch of the day?” Unless you’re really into fish, you might think twice about this advice. Well, think a third time. Located 13 minutes away from our beachside hotel, The Wharf at Orange Beach is a beautiful complex, featuring some of the best shopping, dining and entertainment options on the coast. So now that we’ve cleared the salt air, let’s talk about what else The Wharf has to offer. In the mood to shop? They’ve got it. Hungry? Look no further. 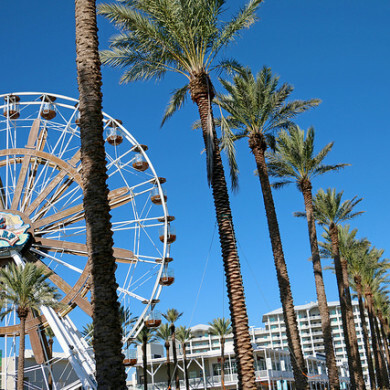 Feel like riding a ferris wheel? Heck, you can do that, too. Get a haircut or massage at Fusion Spa Salon Aveda. Stock up on resort wear or beach gear at The Wharf’s many fine retailers. Build-a-Bear with the kids. Book a sunset cruise that sets sail from the marina. Catch a movie at the Carmike, or play laser tag at Arena, The Next Level. There’s mini golf and a ropes course at Sharky’s. If you’re here in the evening, you’re in for a delight. Spectra is the Wharf’s Sound and Light Spectacular, illuminating rows of palm trees with colorful effects set to music. Take a look at the Wharf’s event calendar to find out what’s going on during your stay. From festivals to wine dinners, parades to fireworks displays, you may find just the thing to make your visit memorable. The complex is also home to a popular Southern United States event venue called The Amphitheater at the Wharf, bringing in acts like Florida Georgia Line, Jimmy Buffett, Keith Urban and others. The Wharf is located at 23101 Canal Road in Orange Beach AL. For more information, visit the website or call (251) 224-1000.